This one baffles me but its seems you want me to look at his skull and that would only mean Pagets since there are no other findings. HEMOLYSIS seems to be the answer. I looked up the answer and there is much more to this question than what you gave me. These question (i hope) r not on the exam. You need to be an expert in the feild to get these correct. I study with doctors of many specialties and they say its too difficult to answer. Radiology images will be tested on your exam. You need not be an expert to recognize “hair-on-end” appearance on the skull – as these are taught at medical school level and also, in USMLE Step I pathophysiology. Most characteristic Radiology images do show up on the exam. So, these questions are often tested on the exam. 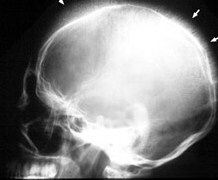 C. “crewcut” – skull on x ray, due to erythroid hyperplasia, seen in Thalassemias.